The 6 Week Bikini Body, developed by Nutrologie, offers a complete diet package to help you burn fat and lose weight in a short period of time. In theory it is very similar to other short-term diet plans that are out there and could easily be confused with other similarly named diet programmes that appear in the run up to the summer holidays. However, the Nutrologie 6 week bikini diet provides a more thorough regime for those looking to shape up in a sort amount of time. Positives: Contains a diet plan and a fitness regime. Negatives: A touch on the gimmicky side – the diet supplements that are supplied are just average. The diet plan is suitable for everyone, apart from the usual exceptions of pregnant women, children and those with specific medical problems, and is ideal for those looking for a rapid weight loss diet, without the dangers associated with some forms of diets, such as starvation and very restrictive diets. The unique selling point of the Nutrologie 6 week bikini diet plan is that it is not just a list of rules about what you can and cannot eat. The plan looks at all aspects of weight loss and provides the tools to maximise your efforts and achieve the best results in a short period of time. 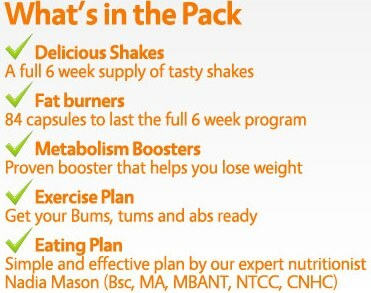 The pack contains six elements: a diet plan, a workout schedule, meal replacement shakes, lipo tablets, detox tablets and meta lite tablets. The diet plan is a comprehensive programme with recipes and meal schedules to help you stick to a healthy diet. The meal suggestions are interchangeable, enabling you to tailor-make your diet to your tastes and preferences. The diet encourages you to eat protein at each mealtime and restrict your fat intake. It recommends a sensible 3 meal and 2 snack system. The exercise plan is geared towards those who like to exercise in the privacy of their own home. It does not require expensive gym memberships or any equipment, and each routine lasts no more than 45 minutes. The exercise and diet plans alone stand you in good stead for weight loss and are key to any effective diet, however this plan also throws in four extra elements to really maximise your results. There are meal replacement shakes that are ideal if you are on the go and are worried that you may not have time to prepare one of the health meals from the meal schedule. Like most other shakes, they are nutritionally balanced and low in calories. The lipo tablets contain natural ingredients that are know for their fat burning properties, in order to get your body fat index heading in the right direction. The detox tablets contain properties that assist in digestion and regulate bowel movement, which can be particularly problematic when a high protein diet is begun. The meta lite tablets are designed to give your metabolism a boost, and are taken just before exercise to get your body into the fat burning zone. All of the ingredients in the Nutrologie plan are natural and have individually have been used holistically for generations to help assist weight loss and boost metabolisms. The lipo tablets contain a cocktail of sweet orange, red orange and grapefruit extracts that help to burn fat. Dieticians have long recognised the benefits of eating grapefruit for breakfast so a shot of grapefruit in the lipo tablets is a great addition to a diet plan. The detox tablets contain insoluble fibre to promote good digestion, and the gut-friendly bacteria, L. acidophilus. The meta lite tablets contain many of the ingredients that you will see listed on other natural slimming pills. Cayenne pepper, green tea extract and Chromium are all known to boost the metabolism without any of the nasty side effects seen from synthetic products. Cayenne pepper is supposedly a firm favourite with the Brazilian supermodel Gisele, who sprinkles it on her food to add a bit of spice and get the blood pumping around that beautiful body of hers. As with all new diets, the media were fast to jump on the 6 week bikini diet bandwagon, and it has quickly become the darling of many publications. Keen to appeal to the modern market, Nutrologie is using the force of social media to attract potential customers. In addition to the company’s own website, there are also Facebook and Twitter pages dedicated to the product citing many success stories and inspirational photos. Although there aren’t any celebrity endorsements yet, with a TV advert campaign about to launch it will probably only be a matter of time until someone in the public eye mentions it. As a weight loss plan, the 6 week bikini diet is rooted in good, solid common sense. The eating plan contains sensible recipes that are low in calories and contain high levels of protein but without completely excluding other food groups. The inclusion of the exercise regime is also an essential part to any successful weigh loss plan. The exercises are accessible to all levels of fitness and because they can be done at home without the need for equipment, it means that there are very few hurdles to overcome. These two elements alone should result in good weight loss, however the additional supplements should maximise results. As with any plan, will power is key and if you don’t have it, this plan will fail like any other. Having said that, because it is a short term plan, and because it claims to have quick, noticeable results, it may be easier to stick to than some more long term systems. Overall, the 6 week bikini diet is a good one. It factors in all aspects of weight loss and provides the tools to help achieve goals quickly and safely. Target customer is typically from the UK. 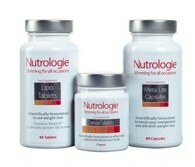 Available the Nutrologie official website and selected other authorised stockists such as Holland and Barrett. 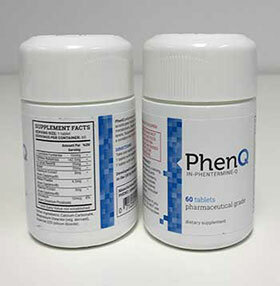 If you are deliberating which diet pills to use and are going around in circles – buy PhenQ. This publication (SlimmersWeekly) is a firm believer in multi benefit weight loss products.